Test the Batteries Before Installation – It’s important to use a fully charged battery. A defective battery will result in low voltage, which will mostly result in early failure. This will also cause early failure of the Series Parallel Switch. Inspect all Wires and Battery Cables – Check your battery cables and starter wiring to make sure they are the proper size and free of corrosion. Inspect for Loose or Corroded Connections – All cable clamps and terminal ends must be clean and tight for the starter to work properly. Check Starter Amperage Draw – Excessive starter current draw will cause slow cranking and starter failure. To check the Amperage Draw, use a Multimeter. Inspect the Flywheel Ring Gear – Excessive wear on the ring gear will result in premature drive wear and poor drive engagement into the ring gear. To spot excessive wear, look at the teeth on the ring gear and see if they are jagged, broken, or excessively ground down. Use Proper Mounting Hardware – Make sure you use grade 5 cap screws and lock-washers to mount the starter to the engine housing. Check the Rotatable Drive Housings – If your starter is equipped with a 24 position rotatable drive housing make sure you position it correctly. 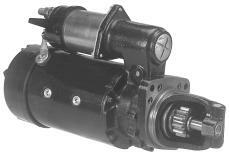 For more on Rotatable Drive Housings, read the instructions provided by Haldex Brake Systems. Need a new Truck Starter or new Starter part for your vehicle? We offer AC Delco, Motorcraft and Ryder Rebuild remanufactured starters for light, medium, and heavy duty truck applications. Find all of our Starter parts for your truck here. This entry was posted in Maintenance Tips and tagged Starter Installation Checklist, Truck Starter by ryderfleetproducts. Bookmark the permalink.